We Picked The 20 Best-Looking Initial Necklaces! Initial necklaces have always been a popular trend in the fashion world. Most of the jewelry lovers tend to use personalized ornaments because these give them a separate individualistic identity. Such necklaces can be customized in different shapes and styles, some of them even come with a birthstone to add a bit more personalization and a taste of color! Initial necklaces are the perfect addition to any kind of jewelry box. These are perfect gifts for any special and festive occasion like anniversary, birthday, Valentine’s Day, mother’s day, friendship day, and marriage ceremony. It is the kind of gift that will make your friend, family and loved ones feel special. 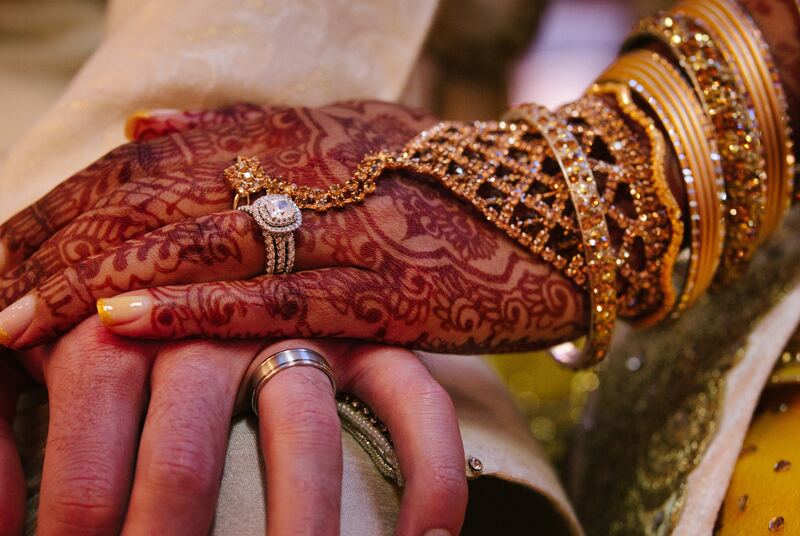 It is a distinctive accessory that the bride will surely cherish for many years. If you are still scowling while reading this and wondering what on earth we are talking about, let us guide you into the light! Initial necklaces are exactly what they sound like – a necklace with an initial! They are basically those ornaments you keep seeing around everyone’s neck, holding a letter of the alphabet as the pendant. 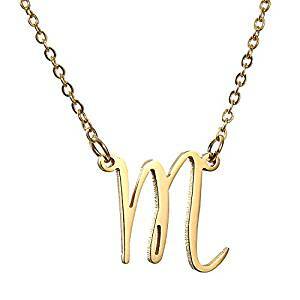 Since these letters usually represent the first letter of the wearer or someone close to her, they have been officially termed as “initial necklaces”. From common people to Hollywood actresses, almost all the women love to wear necklaces with their own initials. 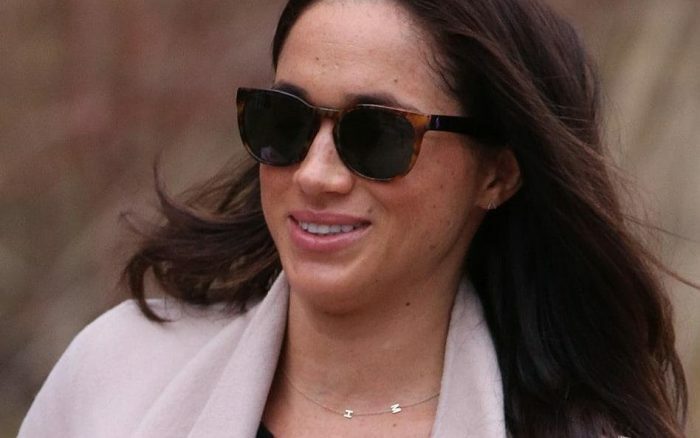 Celebrities such as Miley Cyrus, Katie Holmes, Jessica Alba, Meghan Markle have been spotted wearing such necklaces on various occasions. To help you find a good looking initial necklace to personalize with your initial, we picked 20 that our team at the office liked the most! Check our 20 picks out and get yourself one straight away! The brand oNecklace aims to provide jewelry of polished perfection at the lowest possible price without compromising on quality and material. 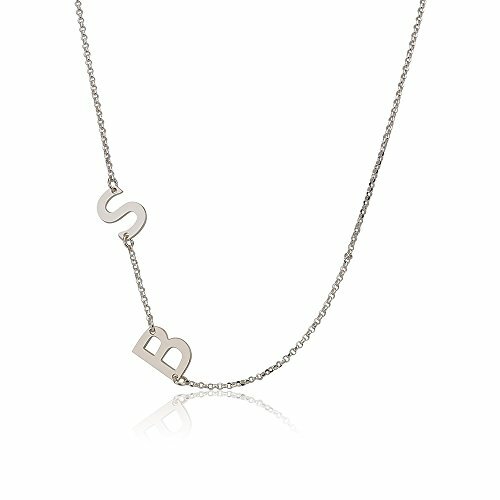 This necklace can be personalized with any initials. The unique character of this necklace lies in its pendant design. This necklace is the perfect choice for those of you who are in love with Old English Fonts as ‘RM Albion’ or ‘Anglican Text’. It is available in three types of metal plates- Sterling silver, Gold plated silver and Rose gold flashed silver. Sterling silver metal plate shines with its metallic traits whereas gold plated necklace over sterling silver glitters with its golden touches. The rose gold plated over sterling silver is the perfect pick for the ladies preferring light and warm color. Any of these necklaces can be found for less than 50 bucks. 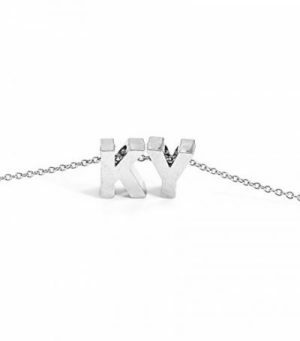 You can surprise your friends with this necklace who are in love with classic fonts. Efy Tal Jewelry has made this delicate, charming, and beautiful necklace which has a wonderful shine to it. This necklace is suitable for every age group and women from all walks of life, including new moms, grandmothers, teenagers, wife, girlfriends and bridesmaids. The necklace is classic, versatile and beautiful for both everyday wear and special occasions. For your freedom and ease, Efy Tal Jewelry has provided the option to customize this ornament according to the customer’s choice. So customize it however you like and present it to your special one with utmost satisfaction. Those who like dainty jewelry should go for this tiny pendant without any second thought. The diameter of the pendant is 10 mm and the chain is about 40 to 46 cm. The chain and the pendant are filled with 14Kt Gold and are completely nickel & lead-free. Price of this initial necklace is also comparatively reasonable. This is also another well-designed product of Efy Tal Jewelry. 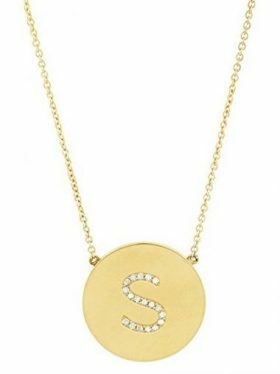 The most lucrative part of this initial necklace is that it has three dainty gold filled pendants which can be personalized according to the demand of the users. You can do a lot of wonder with this three initial pendant. If you have three favorite film stars, you can have their initials in your pendants. Fictional characters are also a good choice in this case. The followers of classic series ‘Harry Potter’ can customize their necklaces with initials ‘H’, ‘R’, ‘H’- presenting the name of Harry, Ron and Hermione respectively. However, if you want to incorporate three initials of your name, then you can also go for this classic piece. The chain and pendant both are filled with 14 Kt Gold, same material as the previously mentioned necklace. Moreover, it is free of nickel and lead, and also completely hypoallergenic. The diameter of the pendant is 10 mm and the chain is about 40 to 46 cm. This is, undoubtedly, a beautiful and charming present for special days like Mother’s Day or Valentine’s Day. 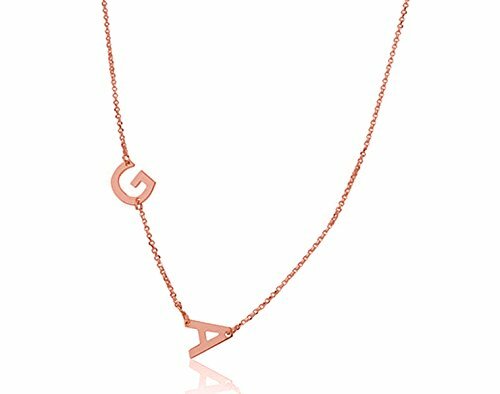 Have you always wondered what a Rose Gold Initial Necklace would look on you? Well, if you are highly fascinated by that thought, then this one with its warm color is a great choice for you! This single hand-stamped initial charm hangs with elegance from a fine delicate chain which adds a sense of romance to this handmade necklace. However, you should put off the necklace during bedtime, exercising, or during any other physically strenuous activities because longtime contact with sweat may wear away the plate faster. You should also stay away from using perfumes, water, body oil and other chemicals while keeping this on because those materials will do more harm than good. This beautiful combination of charm and chain is available in Gold-plated, Rose gold-plated and Silver-plated variations. The length of the chain is almost 17.50 inches and the width is 0.47 inches. You can make the bridesmaids happy with this wonderful ornament. The price is not too high either. So get your hands on this while you can! You will be mesmerized to see the art of the letter embedded in the pendant of this necklace. This necklace is a cute, dainty, gorgeous and perfect gift for Christmas. If any of your friends or relatives are in love with some stylish font, this is the perfect pick for you. You can choose any initial from the letter A to Z in silver or golden color. The material of this jewelry is mainly stainless steel. The chain is 41 cm long with 5 cm extension. The pendant itself is 19.4 mm long, 20.26 mm wide, 1.5 mm thick and happens to weigh only 10 grams. You will definitely love the chain in terms of size and shape. 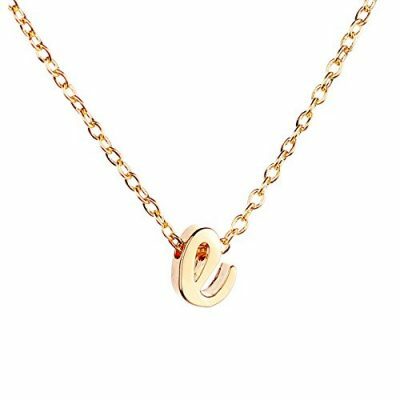 However, this chain is provided by AOLO and you can get their exclusive and wonderful initial necklace at a very affordable rate. Here comes another unique design. 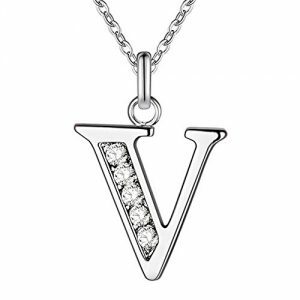 This Sterling Silver Initial Necklace can be found in all twenty-six letters’ variation. 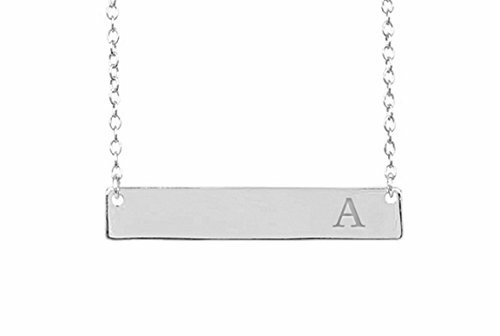 A small rectangle plate with a letter at the corner makes this necklace unique and attractive. If you want to keep your special occasions memorable, you can purchase this necklace for you and your loved one. The horizontally rectangle shaped bar will settle perfectly on your beauty bone, which in turn will end up adorning your whole appearance. 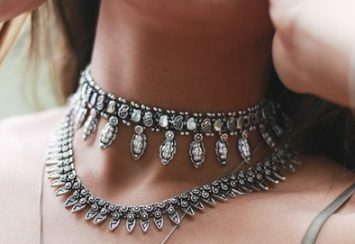 You can wear several necklaces of the same style but with different chain sizes which will give it a personalized touch and create a unique look, specific only to you. It is made of pure 925 sterling silver and offers a strong adjustable 16 to 18 inches silver chain. To make things even easier, you can remove the sterling silver chain now without any hassle using its lobster clasp. The bar measures 23.5mm by 5mm while the initial itself is 3mm. If you are looking for a high quality, sturdy and cute necklace, this rectangle shaped necklace by ‘Sterling Forever’ is the perfect pick for you. Are you fond of small side initial pendant with an aesthetic feature? If so, this necklace is perfect for you! Stylish and classy girls love to have their initials at one side rather having it at the center. This cute little pendant will stay on one of your beauty bones which will surely make it look more special. You can also wear it on prom night with a gorgeous dress. Simple classic necklaces paired with a glamorous dress will increase your charm exponentially! This dainty and chic small size pendant is perfect for everyday wear. The necklace is individually hand polished for a high polish finish. This chain is 16 to 18 inches long and comes with a 2-inch extender. It is made with 925 sterling silver and special care in the United States. The most important feature of this necklace is that it does not tarnish or get dull while wearing it in the bath. This creation of Deidreamers is equally beautiful and classic. Most importantly, this necklace is very affordable for the necklace lovers. Girls with sober choices will definitely pick this beautiful piece of art. HACOOL provides this creative necklace with two initials. 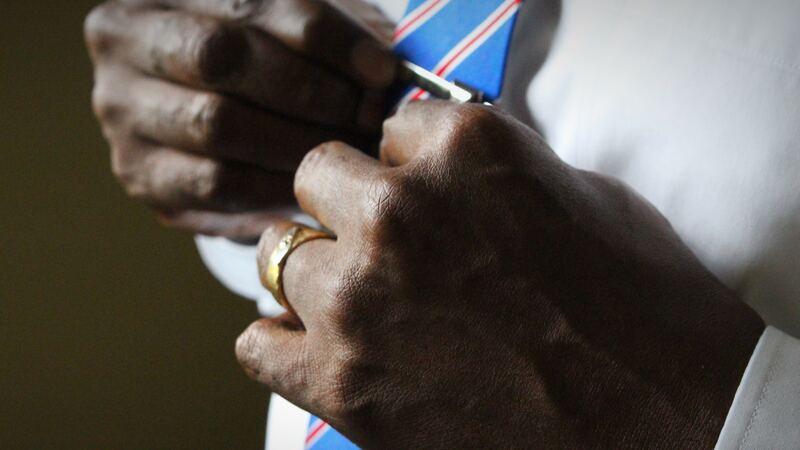 Keeping one initial at the center point and another initial on a side, you can show your versatility in fashion. This is the perfect gift for brides as you will find this necklace convenient for putting their and the groom’s initials together. The entire chain is made of 925 sterling silver. This chain can be customized within the length of 40.6 cm to 45.6 cm. You can add the initial letters of your full name and customize it on own choice. It gives you a bright shine and feels very comfortable to wear. As sterling silver is used in this necklace, it will prevent your allergy and keep you in a good health. You can get this necklace from an online store within an affordable range. Do you want to show the initials of your name in bold mark? Then here is the perfect pick for you! The pendant of this necklace has two initial letters in bold. Putting the letters in bold mark will highlight your initials and people will get to know the short form of your name easily. This customized dainty necklace is a perfect gift for others and even for yourself as it allows you to personalize each piece to your own choice. The chain is made of stainless steel and is 18 inches long in length with extra two-inch adjustable additional chain. This is also perfect for all occasions: birthday, anniversary, wedding, graduation and Christmas as gift or stocking stuffer. This necklace is almost too pretty to have at this cost! You can buy this beautiful jewelry within a very cheap price range. 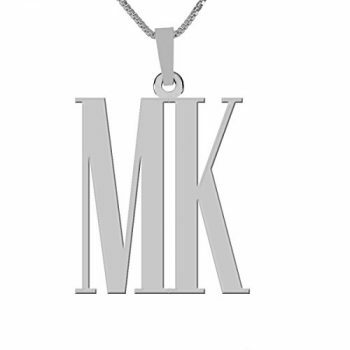 This is very cute and simple personalized necklace with two initials on one side. Keeping two initials at one side manifests your highest sense of fashion and gives you a stylish and aesthetic look. The chain and the pendant are made of 925 sterling silver. Having two initials on the same side gives the chain a unique look as well. 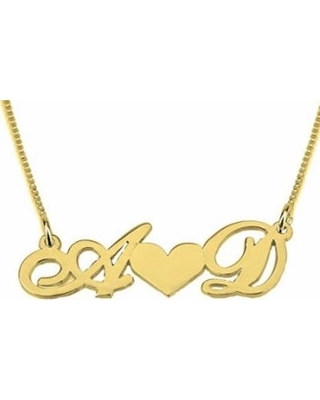 You can incorporate your initial as well as your loved one’s initial in the same chain. This is undoubtedly the best gift for special occasions as Valentine’s Day. This necklace is available in a variety of 14, 16, 18, 20 and 22 inches’ length. The size of the pendant is 0.7 inch and the thickness is 1.1mm. Its price can be from affordable to a bit higher in general. Are you looking for a distinctive design for your initial pendant and still failed to find any? Well, you do not have to worry about that. 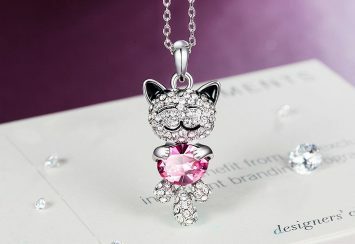 HACOOL presents you a cute necklace with some different outlooks. 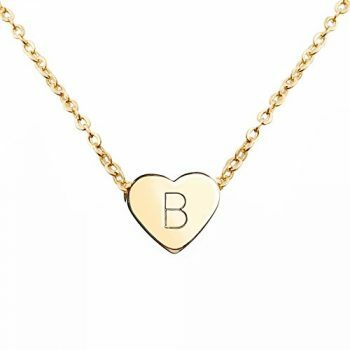 The initials of this necklace are connected to a cute little heart shaped pendant. 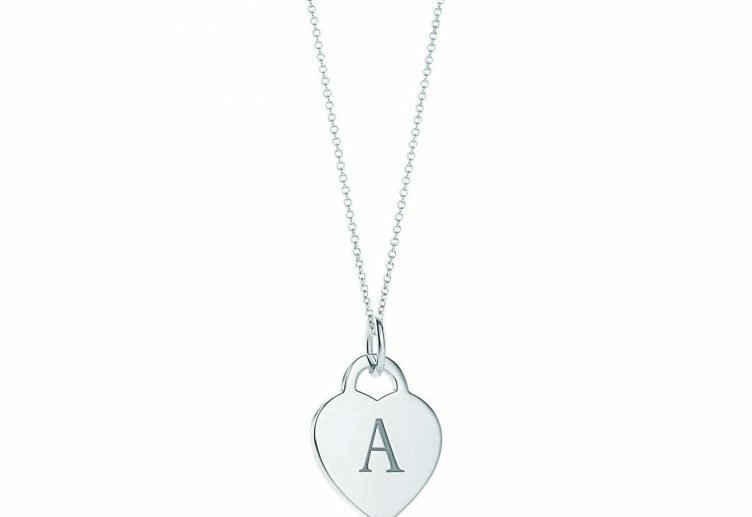 You can customize this necklace according to your choice with the initial letters of your name and your loved one’s name. If you are newly married or if it is your anniversary, then you can surprise your loved one with this outstanding piece of beauty. This piece of jewelry too is made of the very best 925 sterling silver. The length of the chain is 16 to 18 inches. The thickness of the pendant is 0.9 mm and the height is 11 mm. You can find this chain in silver, gold or rose gold color. The price range stays in a pretty affordable range and is also a suitable gift for friends and relatives. The pendant of this necklace contains two initial letters that are connected together. You can also customize this chain which is perfect for either everyday wear or occasional use. 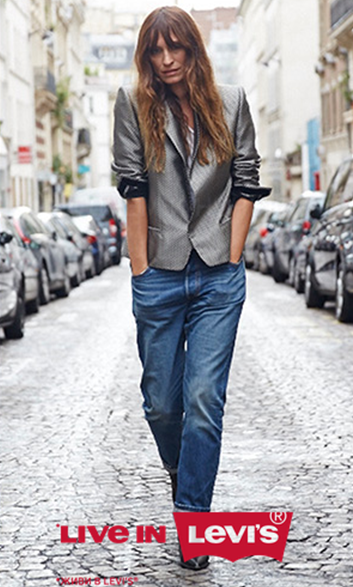 It suits all age groups and all kinds of formal style. If you are a corporate lady wearing blazer or suit, this simple yet attractive necklace will adorn your business get up. The length of the chain varies aptly, ranging from 16 inches to 18 inches. If your full name is in two words, you can pick the two initials of your name and order for this cute little pendant. Price will cost you a reasonable amount and you can find it in silver, gold or rose gold colors. 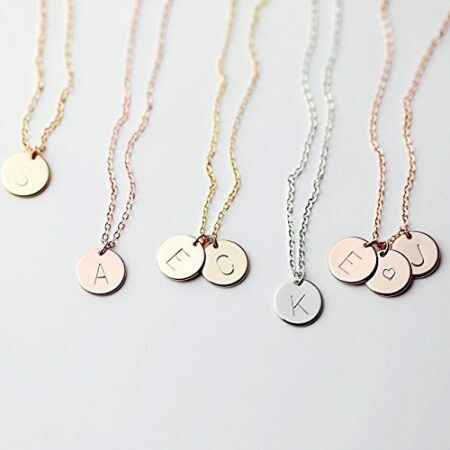 YFN Fashion Charm is providing you stylish initial necklace customized in twenty-six letters. The clear round cubic zirconia inscribed in the pendant gives the necklace an outstanding look. This cubic zirconia adds shine and beauty to this outstanding piece of jewelry. The pendant size varies according to the type of letter. It is a very good choice for gifting your close ones including friends and family. The length of the chain is about 18 inch. The chain is nickel, lead and cadmium free and hypoallergenic. Wearing this necklace for a long time will keep you in a good state. You can get the chain within a very affordable range. This handmade necklace is different from all the necklaces above. 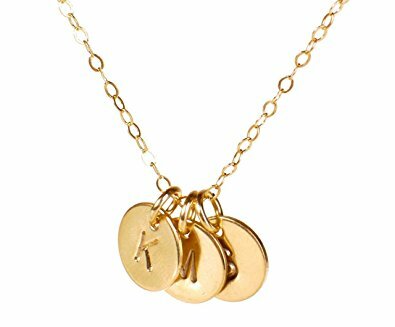 Most of the initials are put in capital letters, but this necklace will allow you to have your initial in small letter. If you want to have a something different from traditional outlook, you can opt for this. This is gold plated necklace over brass. The chain measures 17.5 inches with a very cute little charm. You can customize the charm with your favorite small letter. Though the initial charm is very dainty and small, it is very strong and thick as well. This beautiful and classic can be used both ways, for special occasions as well as everyday wear. This chain also suits the neck of little girls. Teens will be also happy to get this necklace as gift and present on their special days. 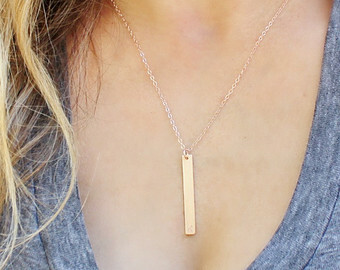 A rectangle shaped vertical bar makes a unique appearance for this necklace. It is unique and attractive in terms of its design and shape. The vertical bar adds additional charm to this beautiful jewelry. You can now convey your emotions better! 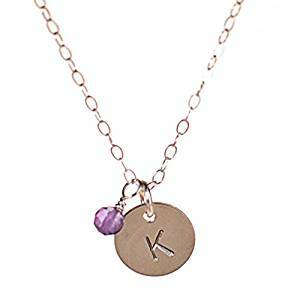 This necklace is stamped with a heart shape and an initial of customer’s choice. It’s a bit unique compared to the other mainstream necklaces since a cute heart is placed right over the initial! It’s not only a wonderful design but also reflects your fashion sense in choosing trendy items. The material is 16k gold plated over brass. The modern design spin on the classic and beautiful bar necklace makes it a coveted, unique and thoughtful gift for every occasion. This is a perfect dainty necklace with the right amount of shine. Brides and bridesmaids will be very happy to get this necklace. The price range is also pretty reasonable. It’s an adorable yet exceptional gift item for your loved ones! This unique alphabetic pendent can be customized with your birthday month charm! It’s the most delightful gift within the lowest possible price range. The cute little part with a round small disc makes this necklace more attractive. The chain is made of 925 sterling silver with a length of 16 inches to 18 inches. The diameter of the pendant is nearly 10 mm but you can also order for a bigger disc. It’s pretty flexible to wear and also made of the finest quality materials. All the metals used are lead-free, nickel free and hypoallergenic so everyone can wear it. It can be used on regular basis but also will make a perfect gift for special occasions like birthdays and for new moms or newborns. A perfect gift for making your loved ones feel special! The fact that it’s handmade from scratch and can also be customized sets its value higher than most jewelry items, since there’s a personal touch to it. You can order it with your loved one’s initial on the leaf. If you want to gift it to someone without the initial leaf, that option is also available. 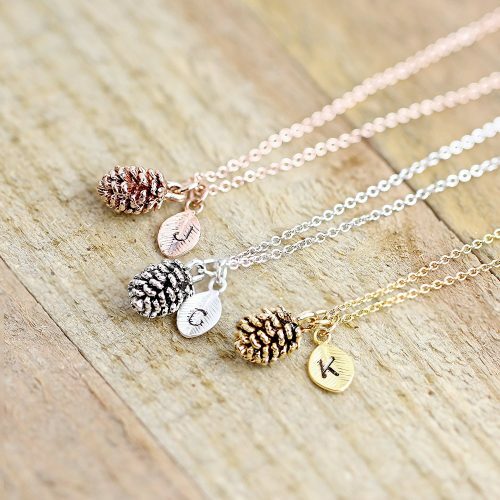 A little pinecone charm with initial leaves adds extra beauty and meaning to the necklace. The beauty of such an elegant looking necklace is not the only astonishing feature. It’s a 16k gold plated necklace available at a very affordable cost! Also, a complimentary gift box comes with it so it’s fully ready to be presented upon arrival. It’s elegant look and versatile features are perfect for daily use and also special occasions. This affordable yet beautiful gift will surely be cherished by your loved ones. Who doesn’t love a heart-shaped pendant having their favorite letter on it? The cute little heart having an initial gives this necklace simple yet beautiful look. The length of the chain is 17.5 inch. This is a very nice necklace found at a very affordable rate. What else could make one feel more special than something that is customized for them! This necklace had the perfect feature to surprise one. People are often worried about metals against their skin but this isn’t like other jewelry. It’s convenient to wear. It could be the perfect gift to make an occasion more memorable. The unique necklace is totally handmade from start to finish. It’s perfect for those who prefer unique and exceptional items. It’s the most charming gift within the lowest possible price range. This necklace is one of a kind! It is nice and lightweight, which makes it comfortable for everyday wear. The necklace itself is shiny with gold plating that looks creative and authentic. The letter is beautifully inscribed in the disc with cubic zirconia. 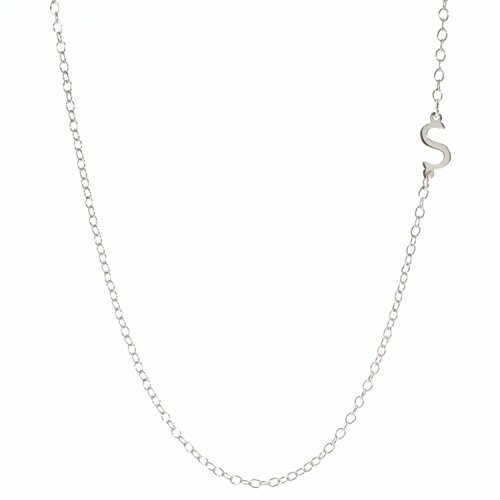 This beautiful initial charm necklace is about 15 inches long with a 3-inch extender and a lobster clasp. This necklace is suitable for regular usage. This elegant piece is also perfect for your loved one. It could be one of the most precious things you ever gift anyone. It’s customizable and unique feature can make anyone feel special. This cubic zirconia is a good choice to create a lasting impression. 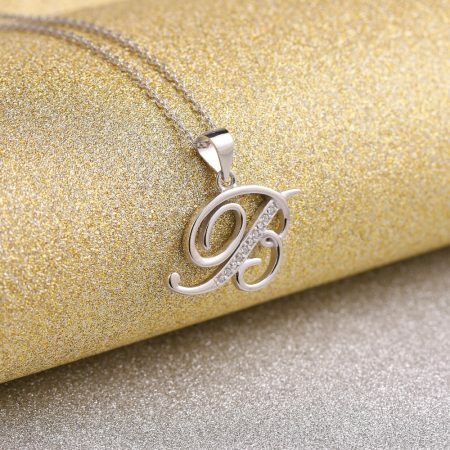 This initial pendant is the perfect gift if you want your special one to keep wearing it all the time. As ones jewelry represents them, girls prefer wearing elegant and enchanting things. This charming and unique necklace holds all those values, thus making it the perfect thing to gift to a girl. Shiny rhinestones are embedded in this necklace which adds extra beauty to its appearance of. This is undoubtedly a cute and loveable piece! It’s not only flexible to wear, it’s also made of the finest quality materials. All the metals used are lead-free, nickel free and hypoallergenic so everyone can wear it. Since it can be used on a regular basis, therefore it’s a perfect gift to serve as a reminder of your love. 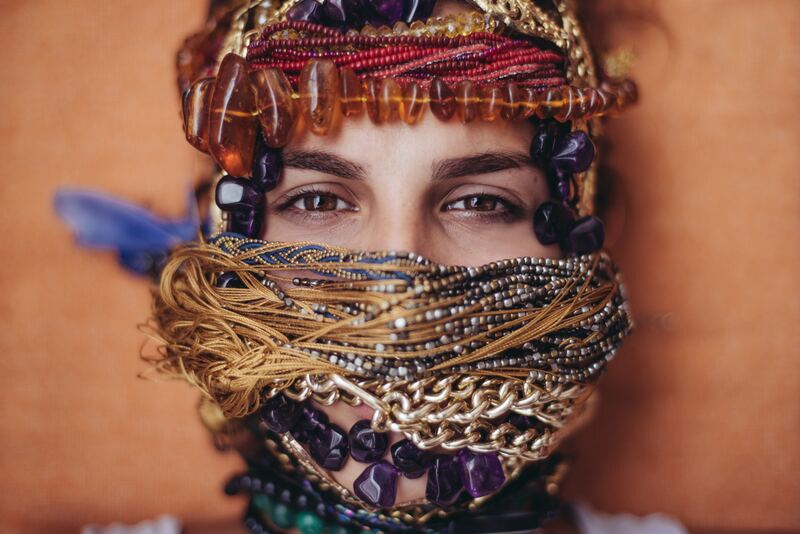 How To Keep Your Necklaces All Shiny And New? All jewelry require basic care including the most precious one. In order to protect your personalized jewelry from corrosion, few easy and simple instructions are to be followed. 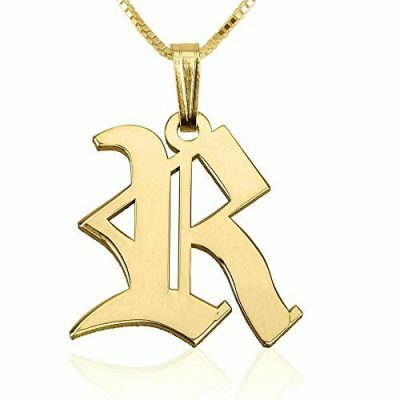 The case is applicable to a solid gold initial necklace, gold plated necklace even for a sterling silver necklace. 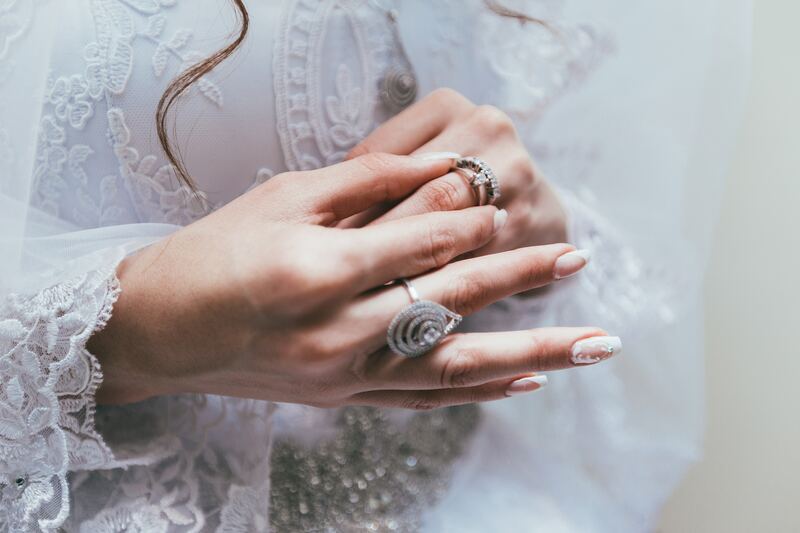 Beauty products like lotions, cream, hairspray, body oil and some cosmetics can directly or indirectly harm your precious jewelry and ornaments. If you want to keep your customized necklaces looking fresh and new, you should put it on after your hairdo and makeup. Who doesn’t love a cool dip in the swimming pool on a hot summer day? But don’t go into the pool with your necklace on. The water from pools contains a sound amount of chlorine which can discolor your ornaments if exposed too long. So when you’re stripping down your clothes, don’t forget to put off your jewelry also. When you are going to take bath, don’t forget to take off your jewelry. Bathing products like shampoo, soap, body wash can tarnish your initial necklace and the pendant having the initial letter may get dull. Your soaps and shampoos may get you a soothing fragrance but they can do significant harm to your jewelry. An undesirable layer may form over your precious jewelry if you’re wearing it too much during shower. If you properly store your jewelry, it will remain as fresh as you bought on the first day. You should keep your customized jewelry in a box where it won’t get tangled up with other jewelry and won’t get dingy from movement. 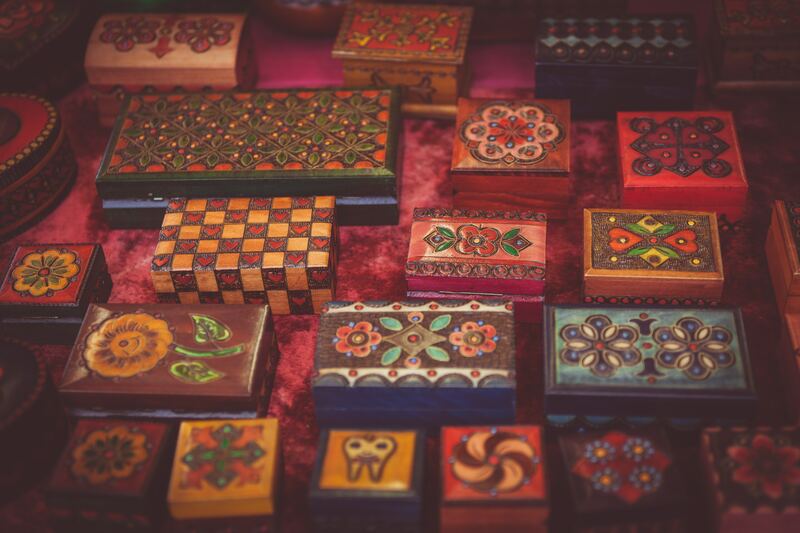 You can use the shoe box as well to keep your ornaments safe if you don’t find any soft lining jewelry box. To keep out of oxidant, you can also use the anti-tarnish strip that will prevent your jewelry from dulling. Don’t forget to use a soft cloth to clean your initial necklaces. These necklaces are so delicate and dainty that rubbing these with a hard fabric may damage its quality or tarnish the material. Remove the fingerprints and oil marks on necklaces that may have accumulated on everyday wear. Once in a week, you should go for a deep cleaning. Use a simple mix of half cup warm water with few drops of mild liquid soap and keep your jewelry soak for three to four minutes. Then remove your jewelry and rinse those off with clean and cold water. Put those in a sanitary place for drying up. Sterling silver initial necklaces require extra care, so it is better to do a silver polish on them. You can purchase the silver cream from any drug store or jewelry store. Treat your personalized jewelry with special care, so that it will last long, preserving its fresh and charming look. So go ahead and buy the piece you always wanted to buy! Remember to take good care of these precious necklaces and charm the people around you every time! Inspiration Shopping for a Meaningful Gift? 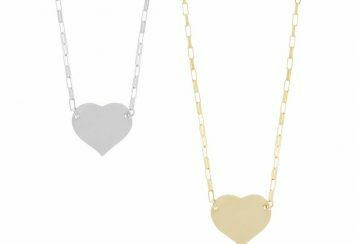 We Found 8 Heart Necklaces In Every Price Range!